Kangaroo Pool Floats; Taco Pool Raft, 6.5 Ft. The kangaro gun tacker ts-623 Label & Barcode Printer is manufactured by KANGAROO and was added around July 2017. 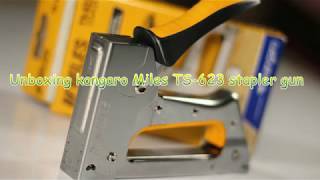 The best price for the Kangaro Gun Tacker TS-623 in India is ₹ 770 sold at Snapdeal and available with free shipping and delivery within 1-5 working days .